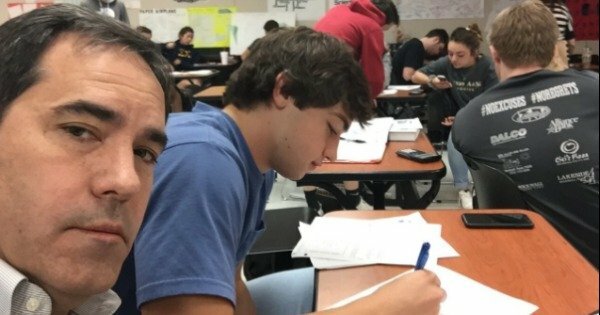 Dad sits with son in class to make sure he behaves. His teenage son wasn't behaving in class. So, he took matters into his own hands. Most parents will threaten their children with a punishment they have no intention of following through on at some stage. We’re willing to bet that when teenager Brad Howard’s dad told him what would happen if he didn’t stop acting up in class, he assumed this was one of those times. WATCH: Parents know how to embarrass kids, but sometimes it’s the other way around. Unfortunately for the teen, his father’s promise to embarrass him at school was not an empty threat. According to Buzzfeed, Brad was talking too much in class and his dad, also named Brad, was getting sick of receiving emails from the school about his behaviour. So, he told his dad told him that if he received one more call from a teacher he would come to the school and sit with Brad in class. And of course, he got another call. Sister Molli tweeted a photo her father took while sitting next to Brad in physics class sent to her in the family’s group chat, which has been liked more than 2000 times. We’re guessing next time Brad receives a threat of embarrassment from his parents, he’ll believe them. What out-there vows to your kids have you followed through on?